Yesterday, as the sun was sinking in the west and a gentle breeze was stirring the branches in the oak and ash trees in the garden, Marcia and I were sitting at the table on the lawn being totally unhealthy: I with a bowl of cheese flavoured crisps from Tyrells (which should earn me a few free samples but won’t), Marcia with some of her favourites – roasted peanuts but they must be dry roasted – and both of us with glasses of wine to hand. Then, as so often happens, the wind dropped and it felt as though the whole world was holding its breath. A pigeon ceased his (or her, of course) relentless cooing and then there was absolute silence. It couldn’t last. A few minutes later the air was filled with the distant sound of medieval instruments: shawms and sacbuts, lutes and cornetts. Only at Dartington could this have been the case. The Dartington Summer School is in progress and there had been a master class held in the Great Hall. Some of the students gathered outside to play together and the sound travelled gently and sweetly to us through the evening air. 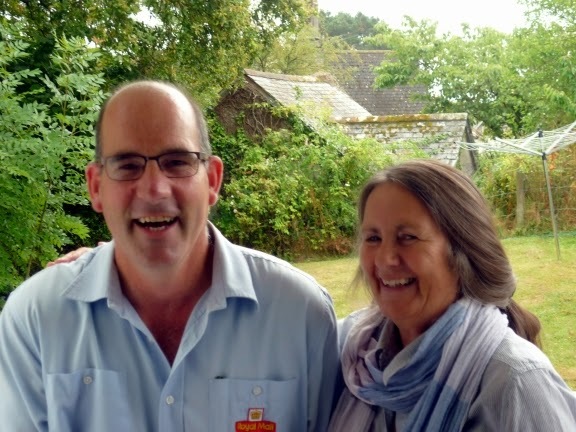 It was a magical moment – then the sun dropped behind the trees and one of the steam engines on the South Devon Railway announced it was leaving Staverton Station by emitting that eerie shriek that only a steam whistle can produce: the magic was shattered but not forgotten. Then two things happened this morning which are both far from being magical. The first has some upsides but I am not sure about the second. Number one: it is raining. After days of wonderful sunshine it really is not at all nice especially as Marcia has to drive to visit her dentist (routine check up – nothing frightening). The upside to this one is, of course, that the garden will be delighted (can a garden be delighted?). Oh, and I shan’t have to water everything this evening. Definitely two upsides. I'm not sure this really tells us anything but . . . The field in which the camelids were grazing is about 350 yards long and I suppose Jazz was about 150 yards away. Turn your back on that field and walk away, bearing left, and after 560 yards you come to the village of Leusdon. Some time ago, I set up a camera on a tripod to take a series of photos of which the above is one. 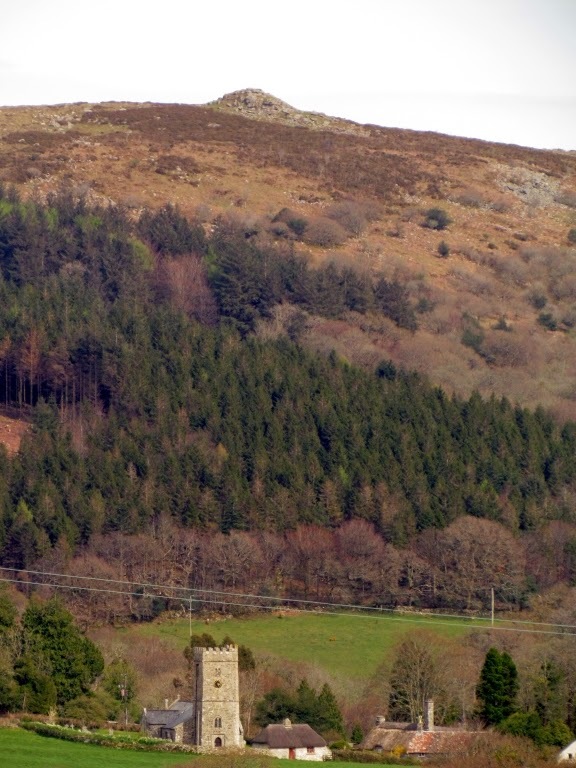 The church is about 1,400 yards away and Buckland Beacon (that rocky outcrop on the horizon) about 3,100 yards away. This made me rather cross. I am grateful to be told that these animals were llamas and only one was an alpaca. I must admit that I am far from expert when it comes to camelids. However, this was a public comment so I feel it is reasonable to reply in public. The writer is also far from expert: the photographs were taken from the field gate while I was standing on the open moor. This might not have been possible using an old Kodak Box Camera but things have moved on since then. His (or her, of course) assumption is wrong. I think why I am cross is that I am a countryman through and through – which I would have thought was pretty obvious to anyone who reads what I write (even my political blogs make reference to fact since I do not know how cities work having never lived in one. Thus what I write is inevitably distorted and I think readers have the right to know that). Unless there is a public right of way across a field under no circumstances would I go into one with stock unless there was a good reason so to do – such as a sheep on its back. The owner of a field is perfectly at liberty to padlock any field gate – even one where there is a public right of way in which case there must be some other means of access such as a stile. However, to say that this is being done for the sake of bio security is not very clever. A person walking in off the open moor is as likely (or not) to bring in disease as are badgers, foxes, birds, rats and rabbits. Rant over. Marcia has been having fun with men this week. That is not to suggest that she doesn’t have fun with men every week but I am not always on hand to photograph these goings on. The other morning she went out to start her car and – nothing: the battery was flat. Could I find our jump leads? No. I haven’t seen them since we left The Hermitage so that came as no surprise. Thus it was that we had to fetch out the RAC (once the Royal Automobile Club) and this arrived in the form of Eddie. Then some goodies arrived by post carried by another eternally jolly chap, Andrew Hyne. 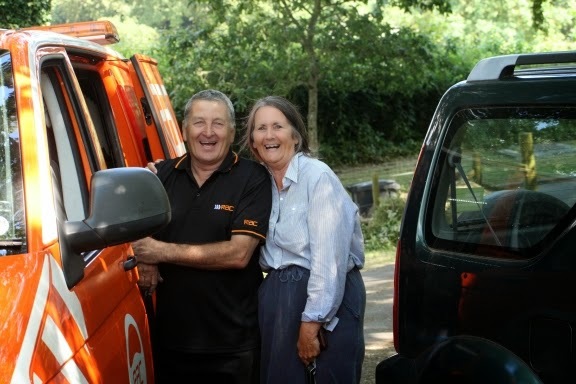 People are often surprised that we know the names of our postmen but if you have been following this blog over the years you will know this is always the case. Do you remember Pete the Post when we were at The Hermitage? If I remember rightly there was a photograph of him up on a blog some time ago. 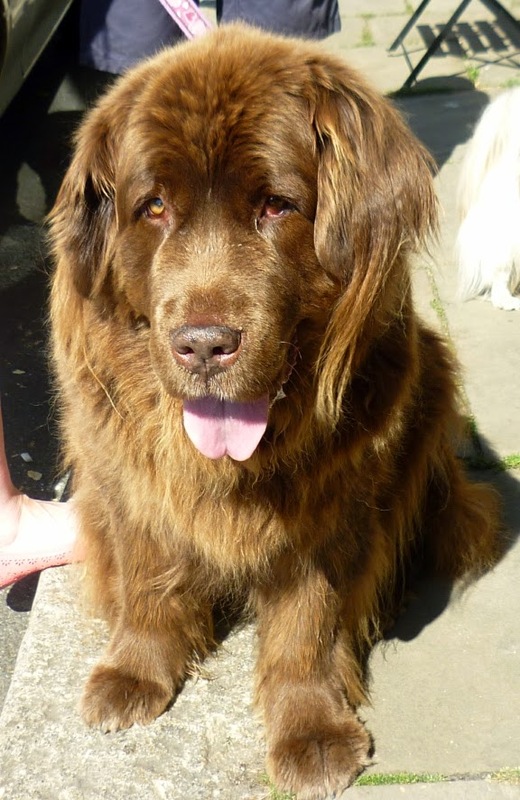 Finally our blog dog this week is an eight-year-old brown Newfoundland called Tia.